Giroud would consider a move back to France this summer but his preference is to remain in the Premier League. Olivier Giroud admits his future at Chelsea looks uncertain following the arrival of Gonzalo Higuain. Higuain has joined Chelsea on loan from Juventus, and will help the void left by Alvaro Morata, who has completed his medical ahead of his loan move to Atletico Madrid. French international Giroud, who is out of contract in the summer, has scored just once in 18 Premier League appearances (six starts) this season. 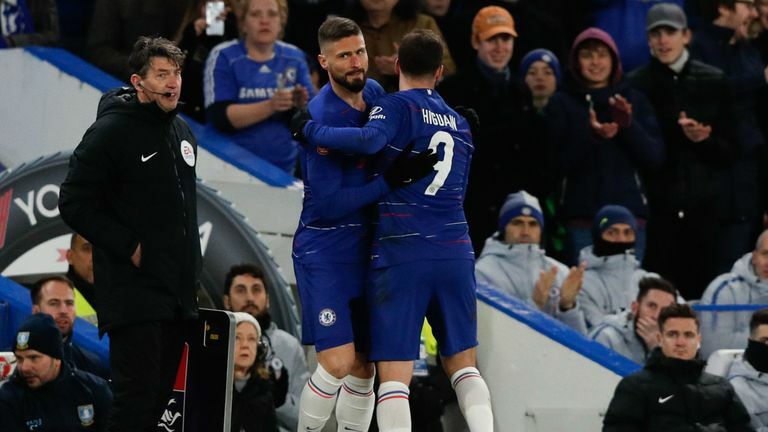 With the arrival of Higuain likely to limit his chances further, Giroud is considering his future and would consider a move back to France this summer, though his preference is to remain in the Premier League. "I will never make people unanimously satisfied with me," Giroud told French outlet Canal, in an interview shot last week but released on Sunday. "There is a little part of regret and frustration. The public expects a goalscorer to score goals. I'm the fourth best goalscorer of French football and nobody can take that away from me. "The coach makes [Eden] Hazard play nine which is detrimental to strikers. But he is the best player I've ever played with. "If the club decides to get another striker, like Higuain, it will certainly darken my future at Chelsea. Higuain made his debut for Chelsea on Sunday in their 3-0 win over Sheffield Wednesday in the FA Cup, playing 82 minutes before being replaced by Giroud. Giroud has backed the Argentine to be a success for Chelsea but warned he will need time to adjust to the pace of the Premier League. Speaking after the game, Giroud said: "It is a good start for him. He needs to take the rhythm, you know, because it is totally different to Serie A. But, yeah, for sure he will score goals for us."